A large order, having a lot of line items, will create an index entry per each OrderLine item from the Lines collection. A single document can generate hundreds of index entries. The above index definitions are correct. In both cases this is actually what we want. However, you need to be aware that fanout indexes are typically more expensive than regular ones. 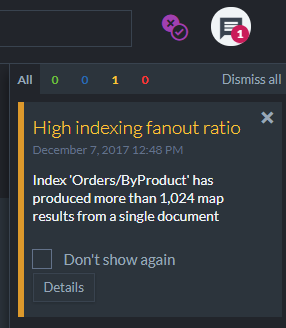 RavenDB has to index many more entries than usual. What can result is higher utilization of CPU and memory, and overall declining performance of the index. RavenDB will give you a performance hint regarding high fanout ratio using the Studio's notification center. You can control when a performance hint should be created using the PerformanceHints.Indexing.MaxIndexOutputsPerDocument setting (default: 1024). 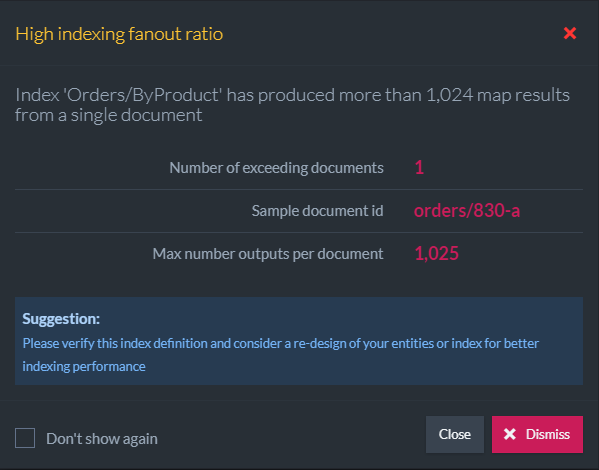 Since the fanout index creates multiple entries for a single document and queries return documents by default (it can change if the query defines the projection) the paging of query results is a bit more complex. Please read the dedicated article about paging through tampered results.